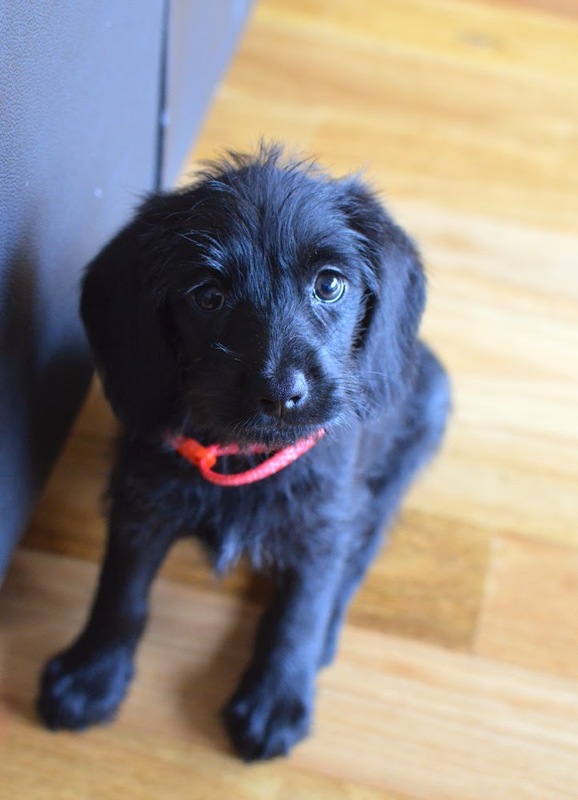 Meet Pepper, our new dachshund moodle (Maltese/poodle) cross puppy. Pepper who is the sweetest little pea of a doggie but can't bear to be left alone for very long and must be within sight of me all the live long day (and a few times each night). So I've been getting not too much sleep and although today is one of my only work days during these school holidays, I'm camped out on the couch listening to the Feist and Ben Gibbard station on Pandora and getting some internet stuff done (including this miraculous and overdue blog post!) while puppers sleeps on her blanket beside me. I don't trust her amidst the chaos of my sewing room and I'm missing getting in there to do printing and sewing (even though my BRAND NEW and EXPENSIVE sewing machine had to be sent back to Janome for some super annoying sensor error so I'll have to use my old machine if I do manage to snag some time). I'm working on training Pepper to be alone for a little bit of time here and there so hopefully it won't be too long before I can get some good chunks of work time back in on Tuesdays and Thursdays. In the meantime I'm working on a couple of new designs and making plans for the Craft & Quilt Fair which is only 10 short weeks away (sounds like a long time until you realise that is only 20 official working days for me... 20 official working days that I'll also be taking care of a puppy...). I'm scheming all sorts of new fabric goodies and waiting for some time to actually produce them! Your puppy is absolutely adorable, and I love seeing her little face on Instagram. I pray you'll be able to find some extra time to sew and print, and I'm so sorry that your machine had to be sent back. That really is that pits.